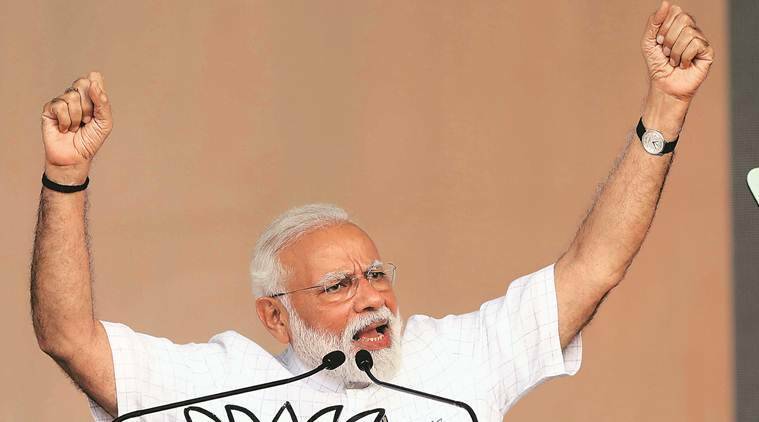 Tearing into the Congress and TMC, Prime Minister Narendra Modi Wednesday accused them of strengthening Pakistan-based terrorists by questioning, demoralising Indian security forces and said he would stand like a wall between such attempts and national security. He called Banerjee a “speed breaker” on the road to development of the state and claimed she wanted poverty to remain so that her “politics of poverty” can flourish. “The Congress with its appeasement politics has always bowed down to terrorists. It was the Congress which removed TADA. It was the Congress which removed POTA. What the Congress is doing is breaking the self-confidence of our Army. Trinamool Congress is part of this sin… Modi will not allow the evil designs of Congress to be fulfilled. May 23 is the expiry date of their manifesto,” he said. Targeting Banerjee, he said: “There are some people in this country who are questioning the air strikes. Who sought proof of bodies in Pakistan? Who doubted the capabilities of our Army? Who insulted the army? Bablu Santra and Sudip Biswas, both from Bengal, laid down their lives in Pulwama. Were they not insulted?”. On the air strike and the anti-satellite weapon test, Modi said: “Even earlier our armed forces had the capability to conduct air strikes. Even earlier our scientists had the capability to shoot down a satellite. But the then government lacked the will and courage,” he said. Referring to the Congress manifesto, he said: “The Congress has promised to end laws against those who do not follow the Constitution or the law of the country. You tell me whether there should be stringent laws against traitors (deshdroh karne wale). If traitors are given a free hand, then won’t you face trouble? Won’t there be trouble in the country?”. He said like the chowkidars who keep telling people “jaagte raho”, he was doing the same. “Your chowkidar is telling you ‘jaagte raho’. He is warning you against their false promises,” he said.